Get a Modo in 15-minute increments with our new booking times! Starting today, Modo members will be able to book in 15-minute increments giving them more flexibility and peace of mind when on the road. So whether you’re stuck in traffic or just need a little extra time, you can extend your booking for as low as $1. • This means you can start a booking at the :15 or :45-minute mark! Yes! The button in our app (and on our mobile site) that lets you extend your booking will be changed to add 15 minutes only. If you need to add more time, tap the Trips menu option and modify your booking by tapping the Start/End times. A friendly reminder: If you can't see the 15-minute option in your app, you may have to close and open it, or update it. If you have any questions, whether you’re at home or on the road, our Member Loyalty Team is happy to help! Email info@modo.coop or call them at 604.685.1393. On our blog: Modo Ambassador Lisa Corriveau shares why she's excited for those extra 15 minutes. Happy Birthday, Salt Spring Coffee! NEW LOCATION at Phibbs Exchange-Oxford: You can find a 2016 grey Nissan Rogue (#747) in front of 1561 Oxford Street ("Lynn Creek Apartments"), just west of Phibbs Exchange in a designated stall on Oxford. NEW LOCATION at Phibbs Exchange-Alleyway: You can find a 2016 blue Toyota Corolla (#778) in the alley behind 1561 Oxford Street, just where the bike path curves off toward Main Street. CAR CHANGE at Marlborough Tower: There's now a 2013 green Fiat 500 (#641) instead of a Toyota Sienna, which is a better match for the size of our parking stall. NEW LOCATION at Lions Gate Hospital: You can find a 2016 white Toyota Sienna (#789) in the Patient/Visitor lot just north of Lions Gate Hospital, against the building in stall #91. LOCATION MOVE: Construction has taken over our old stall at UBC Aquatic Centre, and so our 2013 grey Ford CMAX (#357) has moved to a new location at UBC Bookstore. You can find it in a designated stall on East Mall, across from the Bookstore, just south of the entrance. 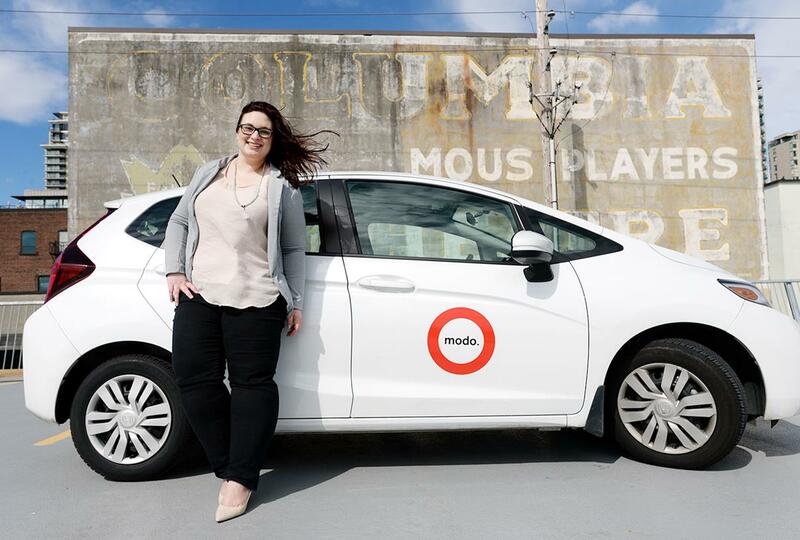 NEW LOCATION at Victory Square: A 2015 grey Nissan Micra (#662) and a 2012 orange Toyota Prius C (#413) now live behind 449 Hamilton Street, just west of Victory Square in the alley between Hastings and Pender. SECOND CAR at CCEC Credit Union: A 2016 white Honda Fit (#790) joins the Nissan Versa Sedan at E 7th & Commercial. CAR CHANGE at W 11th & Trafalgar: There's now a 2012 grey Chevrolet Orlando (#505) instead of a 2015 Nissan Micra. UPGRADE at China Creek Co-op: You can now find a 2016 blue Honda Fit (#791) instead of a 2013 Fiat 500. NEW LOCATION at Swartz Bay Ferry featuring a 2014 brown Chevrolet Orlando (#528) and a 2012 red Toyota Matrix (#371). 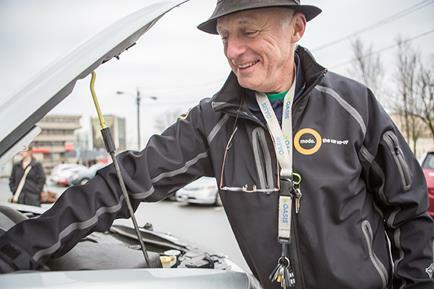 Members in the Lower Mainland and Gulf Islands can now find both cars waiting for them just outside the ferry terminal, in long-term parking. NEW LOCATION at Bowker Manor: A 2016 red Honda Fit (#781) now lives at 2233 Bowker Avenue — just northwest of Cadboro Bay Road — on the east side of the building in parking space #5. One year ago, Farrell wrote his first blog post for us! For his "anniversary" he put together a special post featuring his top tips. Stay tuned for our Fleet Team and Member Loyalty Team sharing more vehicle tips in future newsletters! Modo's Fuel Cards are the easiest way to fuel up your Modo — and there's no receipt needed! But what if you can't find the card or the gas station doesn't accept the card? 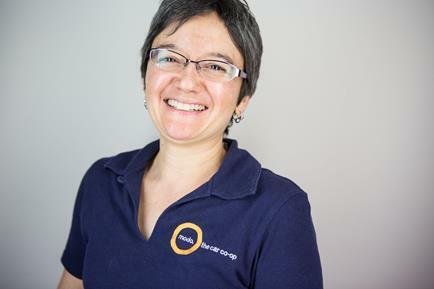 Member Loyalty Member, Mona has some tips to make sure you're successful at the pump. Salt Spring Coffee turned 20 and to celebrate their special day they shared twenty birthday surprises with our members! In true scavenger hunt-fashion we put hints and photo clues out on our Instagram and Twitter page. Didn't find any in your booking? Don't worry, we have more giveaways coming up. Together with our sponsorship partner DOXA - Documentary Film Festival we'll be hiding 10 tickets for festival screenings May 5-15th. Watch our social media for clues! Modo is proud to be a sponsor of the Commuter Challenge, promoting sustainable transportation and shared mobility in the city. Better Environmentally Sound Transportation (BEST) has coordinated the Commuter Challenge in the province of BC since 1996. Challenge the Modo team and sign up (as a workplace or individual) to win some amazing prizes — rock climbing lessons, museum tickets, a VIA Rail roundtrip and more — along the way! Did you know Modo has vehicles equipped with bike racks? Take our Quick Poll and tell us about your experience driving with them! Starting April 28th and ending May 18th all ferry cars are 10% off! Modo Plus is the evolution of the Member-Owner plan. The main difference? Starting today, you’re guaranteed the lowest price for your booking. Period. If you're a Member-Owner, your plan is automatically switched to Modo Plus. If you're a Monthly member and want to upgrade with a $500 refundable shares deposit, give our Member Loyalty Team a call at 604.685.1393 or email info@modo.coop. >> ROAD TO TUWANEK Alicia, Modo Ambassador and local travel blogger, took our Jeep Renegade for a diving trip on the Sunshine Coast. >> FAMILY AFFAIR Modo Ambassador Lisa Corriveau does not need a car most days. For the times she does, like when she's visiting her "far flung" relatives, there's over a dozen Modo in walk-able distance. >> 95 PERCENT The average car sits idle 95% of the time. Ambassador Adrian Crook prefers to share - and stay flexible. Read why. >> HONDA FIT TRIP Modo Ambassador Megan took her favourite Modo to Squamish. >> MODO MIXER Modo hosted a LOCO Business Mixer in our Vancouver office in April, featuring a Sharing Economy panel. Find pictures of the event here. >> SHARING AND COMPARING Our friends at Hitchplanet put together this infographic on ridesharing and carsharing in Vancouver! 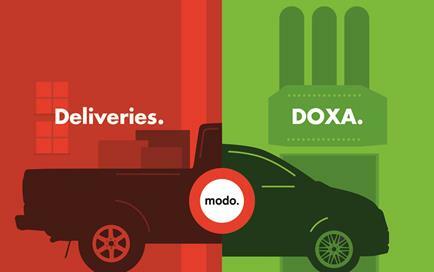 Modo is a proud sponsor and transportation partner of the 15th DOXA Documentary Film Festival! Start a team, join a team or register solo! Check out the list of Celebration Stations and prepare for a week of fun events! We are proud sponsors of the Commuter Challenge, a friendly competition (with great prizes!) between individuals and workplaces. Read more.